The WiFi-Adaptor provides a simple solution to add Wi-Fi capabilities to TERN controllers. 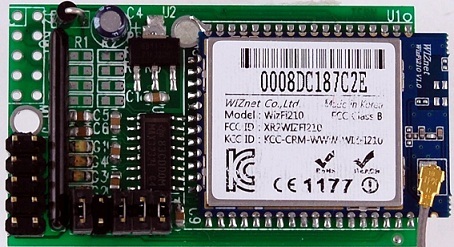 The WiFi-Adaptor includes an 802.11b compliant, fully certified wireless module (WizFi210, WizNet). It brings WiFi connectivity to a standard serial port (TTL or RS232). The module has all hardware and firmware to handle the Wi-Fi network overhead. No Wi-Fi specific firmware programming is required, such as TCP-IP. Users can use simple AT commands to access the Wi-Fi network for configuration and data communication. 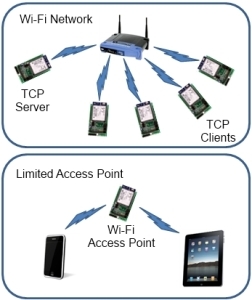 In a standard 802.11b wireless network, TERN controllers with the WiFi-Adaptor can be configured as a static IP address TCP Server or as a TCP Client. Clients can communicate to the server over a standard commercial Wi-Fi router. The WiFi-Adaptor supports a Limited Access Point (AP) feature to host a direct connection with a wireless device like an iPad, iPhone, or Android-phone. TERN offers sample firmware to allow users to operate a TERN controller with an iPhone. There are two versions of the WiFi-Adaptor: WiFi-TTL and WiFi-232. The WiFi-TTL accepts TTL level UART TxD and RxD signals. The WiFi-232 is ready to connect to a RS232 port. The default serial baud rate is 115,200.